Fig. 6. 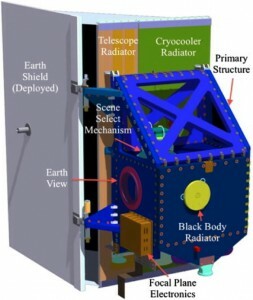 Drawing of the Thermal Infrared Sensor (TIRS). Like OLI, TIRS is also a push broom sensor employing a focal plane with long arrays of photosensitive detectors (Fig. 6). A four-element refractive telescope focuses an f/1.64 beam of thermal radiation onto a cryogenically cooled focal plane while providing a 15-degree field-of-view matching the 185 km across-track swath of the OLI. 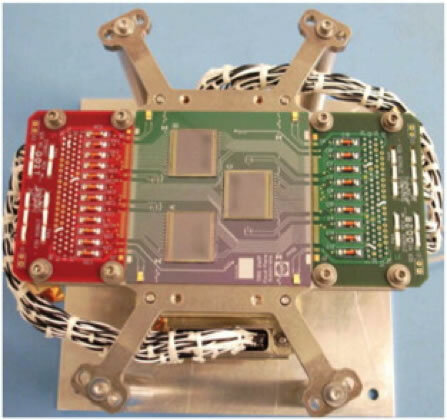 The focal plane holds three modules with quantum-well-infrared-photodetector (QWIP) arrays arranged in an alternating pattern along the focal plane centerline (Fig. 7). Each module is covered by spectral filters that transmit the two specified band widths. Each QWIP array is 640 detectors long cross-track allowing for overlap between the arrays to produce an effective linear array of 1850 pixels spanning the 185 km ground swath with a 100 m spatial resolution. 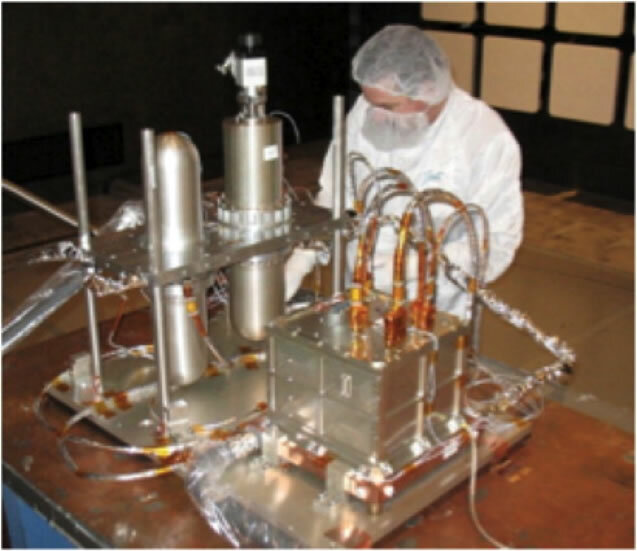 TIRS will be the first spaceflight instrument to use QWIP arrays. 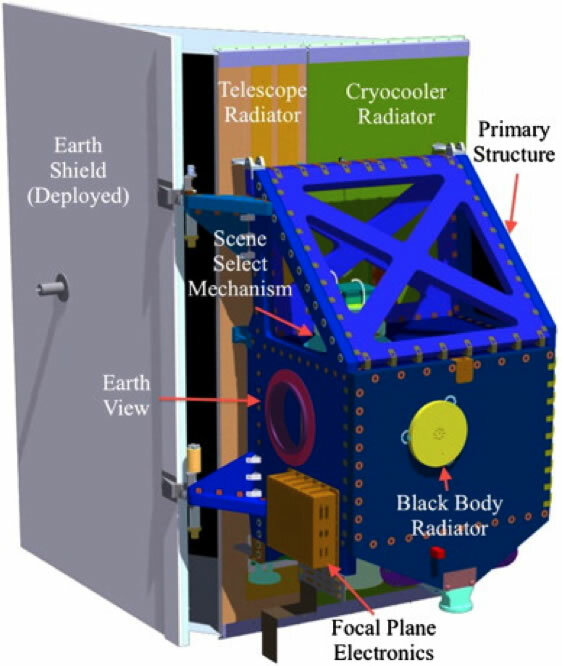 A mirror controlled by a scene select mechanism will flip the field-of-view between nadir (Earth), an internal blackbody, and a deep space view for on-orbit radiometric calibration without changing the nominal earth-viewing attitude of the LDCM spacecraft ( [Irons and Dwyer, 2010] and [Montanaro et al., 2011]). Fig. 7. Photograph of the TIRS focal plane showing the three QWIP detector arrays. Fig. 8. Photograph of the TIRS cryocooler (courtesy of Ball Aerospace & Technologies Corporation).